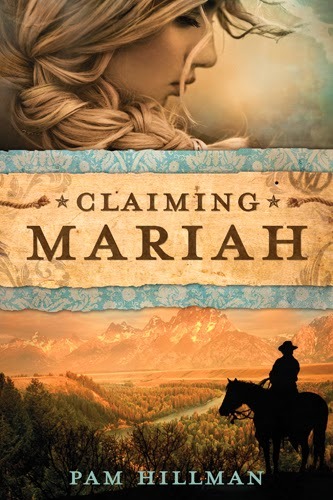 Grandma just finished reading Claiming Mariah by Pam Hillman and couldn't wait to share her review with you! This book from Tyndale House Publishers is Pam Hillman's second novel, which comes on the heels of her debut novel, Stealing Jake, a finalist in the International Digital Awards and the 2013 EPIC eBook Awards. This historical romance takes place in Wisdom, Wyoming in the Old West days. It is a beautiful story of family struggles, devotion to each other, and devotion to God. The characters struggle with trying to make right the actions of the past. The Lazy M ranch is already struggling when brothers, Slade and Buck arrive at the ranch. Why did they come and what do they want? Did they have a claim to the ranch that Mariah has struggled so hard to keep going after her father's death? This is a very fast-paced book that held my interest so much I had a hard time putting it down. My favorite part is how it shows repeatedly that prayer is a vital part of the characters' lives. They demonstrate a strong belief that God has a place for them all. Claiming Mariah demonstrates how one can change from a life of blame and doubt to discovering the peace afforded by prayer as Slade works through his feelings. This is a story of how families can come together when they know the whole truth and that trusting God never fails. I would highly recommend this book to anyone desiring an Old West Christian romance.